Our next big market will be on Saturday MAY the FOURTH. We are taking advantage of the date and creating a STAR WARS themed market. Wear your STAR WARS gear/costume/tshirt/anything. Prize raffle for everyone who dresses up. Come down for an early coffee and enjoy the BBQ delights (including our sausage sizzle and our famous burgers with the lot, veggie burgers and spinach and ricotta rolls), or sample some home made treats and gourmet pastries and bread. Bring the kids and buy some books from the book stall, visit the face painter or visit many of the stalls with goodies just for kids. There will be a HUGE KIDS MARKET too run by kids, selling...well, kids stuff! Enjoy music across two stage areas whilst you wander amongst the stalls. DiMattina coffee's up at 8:30am...and we all know how great the coffee is. Come on down, enjoy a chat and a shop. Bring the dog, bring the family and bring your own bags please and coffee keep cup (or grab an ugly mug for a discount). There's lots to buy and we are both friendly AND environmentally friendly. ATM on site. 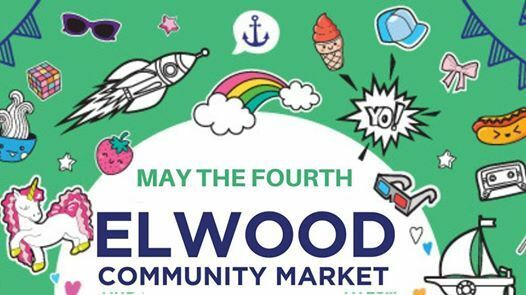 *The Elwood Community Market is run by volunteers, parents and staff of Elwood Primary, with all profits from the market going to the Primary School. Thanks for your support.